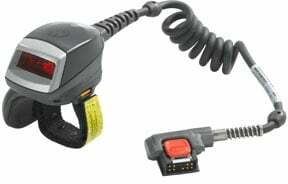 Motorola RS419 Ring Scanner - Hands-Free Ring Scanner, 1D Laser, Cable to Hip Mounted Unit. Whether moving products through warehouse, retail store, or moving packages through distribution centers and onto trucks for delivery, every time they need to set an item down to check a paperwork order or scan a barcode with a handheld device, their productivity decreases. When you add a ring scanner worn on a finger to Motorola Solutions' WT4XXX wearable mobile computers, enables workers to keep their hands and eyes on the items they are handling. Worker productivity increases and a split second press of the RS419 Ring Scanner trigger also verifies task accuracy and provides the real time inventory information you need to maintain stocking levels and reduce out of stocks. The Motorola RS419-HP2000FLR is also known as MOT-RS419HP2000FLR	or RS419HP2000FLR	.